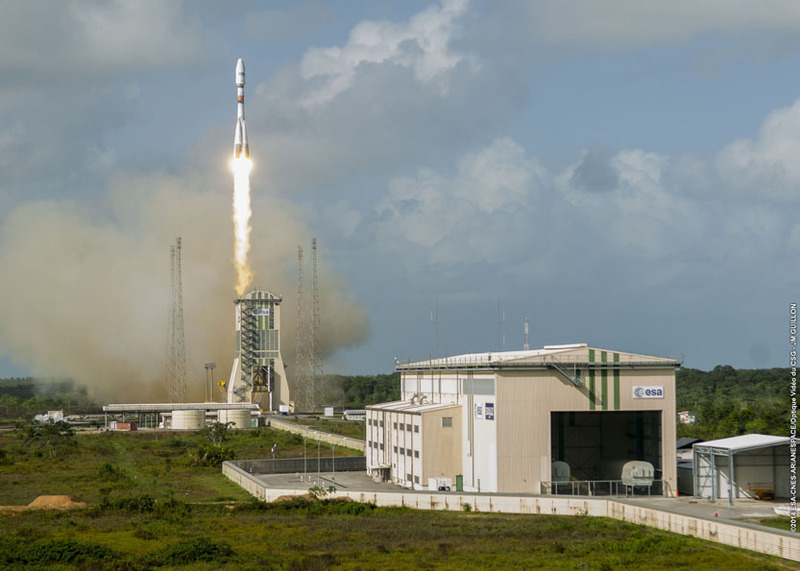 A Soyuz rocket lifted off from French Guiana on Thursday, launching four satellites owned by O3b Networks nearly 5,000 miles above Earth to expand access to high-speed Internet in the developing world. The addition of four new spacecraft grows O3b’s fleet to a dozen satellites, and the company based in Britain’s Channel Islands has plans to purchase and launch more satellites in the next few years. O3b kicked off commercial service Sept. 1, and the satellites launched Thursday will officially join the fleet in February. “It’s expanding our network,” said Steve Collar, CEO of O3b Networks, in a phone interview from the French Guiana launch base. “It takes us to more than 100 gigabits up in orbit, and that allows us to bring a lot more capacity to our customers and cope with the demand that we’re seeing in the market. “Just within the last three months since we’ve been in full commercial service, we’ve seen pretty much every network that we’ve got on the fleet today growing substantially, in some cases quadrupling throughput,” Collar said. The Soyuz rocket’s Fregat upper stage released the satellites into orbit more than two hours after liftoff from the Guiana Space Center — a European-run spaceport on the northern coast of South America — at 1837 GMT (1:37 p.m. EST). 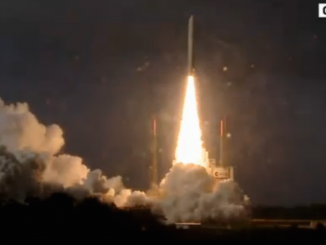 The launcher pivoted on to a trajectory east from French Guiana, climbing through scattered clouds before shedding four kerosene-fueled booster rockets two minutes after liftoff. The three-stage rocket climbed into space over the Atlantic Ocean before deployed a Fregat-MT upper stage for a series of three main engine burns to position the O3b satellites in a targeted orbit about 7,830 kilometers — 4,865 miles — above the equator. Each weighing about 700 kilograms, or 1,543 pounds, the spacecraft separated in pairs from a dispenser mounted on the Fregat upper stage. 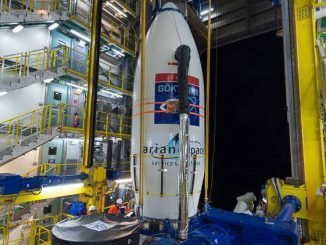 Arianespace took extra time to confirm the outcome of Thursday’s launch after officials prematurely announced a successful mission on the Soyuz rocket’s last flight from French Guiana. During the botched Aug. 22 launch, the Soyuz rocket’s Fregat upper stage put two European Galileo navigation satellites in the wrong orbit. Investigators blamed the anomaly on a frozen fuel line that disrupted the flow of propellant to two thrusters designed to properly point the Fregat rocket stage. After Fregat’s manufacturer NPO Lavochkin agreed to change design documentation, technicians inspected Fregat stages already built and — where necessary — rerouted propellant lines and plumbing for the rocket stage’s super-cold helium pressurization system to ensure the hydrazine fuel would not freeze on future missions. 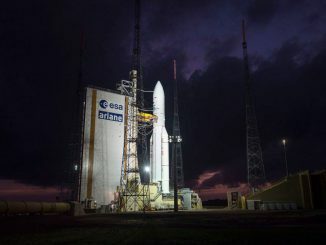 The European Commission and the European Space Agency planned to launch two more Galileo satellites aboard the final Soyuz flight of the year from French Guiana, but officials grounded the mission after the August launch failure. Galileo managers are now deciding whether to launch next set of navigation satellites in 2015 on a Soyuz/Fregat rocket or aboard Europe’s heavy-duty Ariane 5 booster. When the Soyuz launch opportunity became available, O3b jumped at the chance to launch its next quartet of satellites sooner than planned. The satellites were on pace to be ready for launch by the end of 2014. O3b will have 12 spacecraft in orbit when the satellites launched Thursday enter service — 10 in active operations and two satellites held in reserve as spares. The first four satellites launched by O3b in June 2013 have a defect in their power systems, a fault that the company says could reduce each spacecraft’s usable lifetime. O3b put two of the satellites into standby mode earlier this year in hopes of having them available in case the other two spacecraft fail. Four more satellites launched on a Soyuz flight in July, and the third group arrived in orbit Thursday. Ground controllers plan several days of testing on each spacecraft’s primary systems, then they will guide the satellites into a slightly higher orbit to enter O3b’s constellation. Officials plan several weeks of activations and checkout of the Ka-band communications transmitters and antennas. Collar said O3b has started the procurement of more satellites, eyeing a contract award in early 2015. “This completes our initial constellation,” Collar said. “This will keep us in good shape for the next couple of years while we work on and wait for the next satellites to be built and launched. We’ve made sure that we have enough capacity on these 12 satellites to take us through. O3b filed a $300 million insurance claim after running into the power system problems with its four satellites, and the money could go toward payments for new spacecraft. O3b says one strength of its business — compared to traditional satellite telecom operators — is a low-latency Internet connection. The O3b satellites orbit at 5,000 miles, more than four times closer to Earth than geostationary satellites, reducing the amount of time it takes for a signal to bounce between the spacecraft and Earth. The satellites in equatorial orbit can reach customers between 45 degrees north and south latitude. Collar said O3b Networks is now beaming Internet connectivity to service providers and telecom operators in Africa and the Pacific islands, reaching customers in South Sudan, Madagascar, the Democratic Republic of Congo, East Timor, Samoa and Nauru. “We see a lot of demand coming from Africa and the Pacific, and we think that we will soon see that same demand in Latin America and Asia,” Collar said. O3b receivers are also installed on three Royal Caribbean cruise ships to provide passengers with high-speed Internet, Collar said. The energy and government markets are also key business areas for O3b.